Perfect branding tool. 1800-YOUR-BRAND numbers are perfect branding tool because they are unique, easy to remember and toll-free across India. Your callers will never pay for the calls made on this number. All your calls will be handled automatically with a customised greeting and then calls are forwarded to pre-defined recipient depending upon caller's input. Each and every call is logged in our system i.e. at the times when you are not able to attend your incoming calls our system will send you a SMS reminding about the missed call. Record full conversations that can be downloaded any time. Best for business transactions, which are based on telephonic conversations only like order placement or e-commerce transactions. Unable to attend the call? Don't worry and let your customers send you a recorded audio clip instead. Define your own call forwarding rules, blacklist and whitelist. You can also set failover numbers so that your customer can contact you no matter what the situation is. Click-to-call service allows you to connect with your website visitors and turning them in to paid customers. Do you have any idea how many of your incoming leads are missed by your tele-executives? Do you know how many calls you receive on daily basis with detailed analysis? We have ready charts with all those data as well as daily e-mail alerts with important matrices. Our system works 24x7, so even when you are sleeping or out for a family hangout, Ziffy keep handling your business calls. No buzz words... in simple layman term, Ziffy lets you free from the hassles of managing and setting up telecom infrastructure at your end. 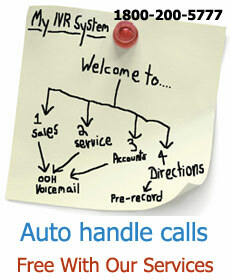 Receive one or million of calls, our system will handle every call by automatically assigning resources as required. Switch from other service providers or show us a quote lower than ours and get 50% off. Confused? Why should you buy toll-free? The dilemma of owning a full setup or outsource the infrastructure is always confusing. We have simplified the process so that you can take the decision easily. Click here to check our small presentation about Cloud Telephony. 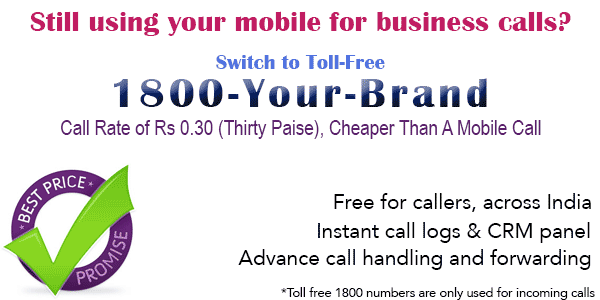 Cheapest Toll Free IVR Number service provider with cheap toll free incoming call rates. Get your number now. Starts from Rs 675 per month..
© ZNI Wireless Pvt Ltd.